While holding a seminar on the web makes perfect sense in this fast-paced, 24/7 world in which we live, the steps needed for creating and hosting an effective webinar is something that still stymies people, even a decade after the word was invented. Needless to say, not everyone is an expert at delivering them. Practical tips for webinar success... and more! 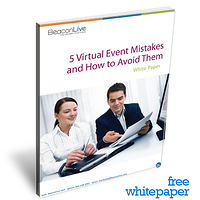 Download this white paper on webinar best practices today to ensure that you avoid these errors when developing and presenting your next virtual event. Simply fill out the form to access your free copy!